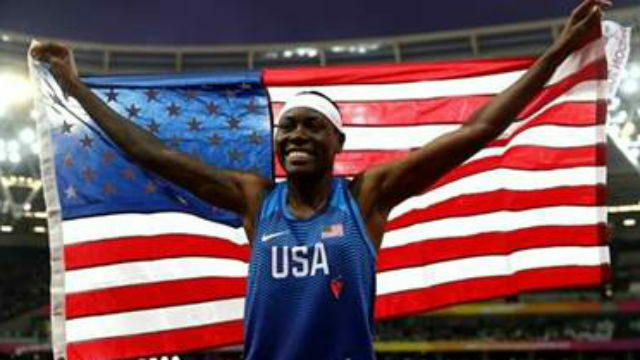 Brittney Reese, a San Diego Mesa College track coach, took her fourth world title in the long jump Friday at the IAAF World Championships in London. Reese, 30, earned the victory with a leap of just over 23 feet in her third jump. She fouled on her next three tries as her competitors aimed for her mark, but they fell short by about 3/4 of an inch. After the race, she told reporters that she was jumping in memory of her grandfather, who died two weeks ago. She also said she planned to compete in the 2020 Olympics. Reese is a six-time USA Track & Field Outdoor Women’s Champion in the long jump, a three-time World Outdoor Champion, a three-time World Indoor Champion, the indoor American record holder, the 2012 Olympic Games gold medalist, and the 2016 Olympic Games silver medalist. Born in Inglewood, CA, and raised in Gulfport, MS, she began coaching at Mesa College three years ago. Reese said that as a coach, she makes one thing clear to anyone who walks onto the track at the community college in Clairemont Mesa. “You’ve got to be a student first. You have to take care of business in the classroom before you can take care of business on the track,” she said.